Download these Free Newborn Lightroom Presets to make your baby photos soft, pastel, and cute in several clicks. Newborn photography is always cute and touching. But in some cases, pictures of little children require basic image editing and color correction, if we want them to look perfect. Editing newborn photos in Lightroom is the easiest way to achieve realistic results. If you need to simplify this process, just use the following dreamy baby presets. They help to get creamy skin tones in Lightroom, make the images look natural and appealing. 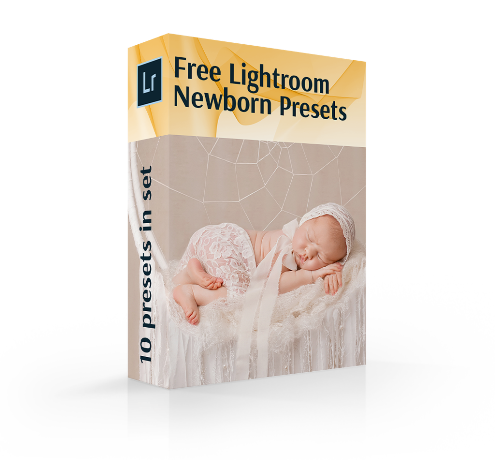 These free newborn Lightroom presets are created by experienced photographers, but are suitable for beginners. Photo editing never was so easy before. You won’t ask how to use Lightroom presets, because it doesn’t require any special skills. Any user can download and apply the effects in a few minutes. Why newborn Lightroom presets are so popular among professionals and amateurs? The thing is they allow achieving the right tone or nice colors without any efforts. Lightroom baby presets free collection is your chance to transform your pictures into unique and professionally-looking photos. Don’t worry about the aesthetics and naturalness of the final images. The Lightroom presets for professional photographers won’t add any artificial effects. They simply improve some details and remove small defects. You can surely apply the free Lightroom presets for portraits, family pictures, photos of posing or sleeping babies. Our Free Newborn Lightroom Presets allow receiving different improvements. You can get nice tones of skin, focus on the newborn, softer lines. Using them you will get rid of unwanted baby skin redness, too contrast colors and other shortcomings. LR Preset #2 "Warm Light"
LR Preset #4 "Light Pink"
LR Preset #5 "Soft Skin"
LR Preset #7 "B&W Soft"
LR Preset #8 "Tonning Matte"
LR Preset #10 "Tonning Warm"
This collection of Free Newborn Lightroom Presets is created by professional photographers with rich experience in shooting and editing photos of babies. They clearly set each parameter to make picture editing as easy, as possible. That’s why the Lightroom baby presets are useful both for skillful photo editors and newcomers. It’s a nice opportunity to save your time and surprise clients with incredible results. What can you do with these Free Baby Lightroom Presets? The Lr plugins adjusts brightness, contrast, and color settings. The baby Lightroom presets add light and color accents on the photos. Enhance the tonal contrast and overall sharpening. They will change the color of certain parts on the photo to fit the overall color scheme. Eliminate redness and enhance skin tone. Free Newborn Lr Preset #1 "Soft Light"
This preset was taken from "Newborn Pro"
One of the best warm Lightroom presets that perfectly suits cute and funny newborn photographs. You can surely use it, aiming to create a cozy and lovely atmosphere, emphasize babies’ tenderness and positive emotions.. Newborn Lightroom Preset #2 "Warm Light"
One of the most popular free newborn Lightroom presets that is widely used for improving pictures of sleeping babies. The effect of adding warm colors and shades allows you to get a charming and adorable result. Newborn Lr Preset Free #3 "Pure"
A universal Lightroom preset that is recommended for the photos with many blue colors and hues. Make professional muted colors in several clicks. Lightroom Newborn Preset #4 "Light Pink"
One of the loveliest newborn Lightroom presets that can be applied both to photographs of boys and girls. Adding beautiful pink light, this effect looks so romantic, touching and magically. It’s a nice idea to use it for pictures of a sleeping child and add some toys and accessories, associated with a fairy tale. Lr Preset for Newborn #5 "Soft Skin"
If you are interested in free newborn Lightroom presets for portraits and close up-shots, this plugin is the best choice for you. Red skin and other defects can spoil baby images. So, use this Lr preset to make the newborn’s skin clean and shine. Lightroom Preset Newborn #6 "Brighten"
It is a special effect. You can use it to get creative vibes with soft vignette. Professional white balance adjustment that is very important for baby images. Newborn Preset for Lr Free #7 "B & W Soft"
Apply this Lightroom preset in white and black colors to emphasize shapes and composition. Highly recommended for the photos with too harsh light. Free Newborn Preset for Lr #8 "Tonning Matte"
This Lightroom matte effect is one of the favorites presets for newborn photographers. It’s an easy way to highlight the delicate baby’s skin, its innocent and sweet dreams. The matte effect is the most suitable for pictures of lovely sleeping babies. Preset Lightroom Newborn #9 "Saturation"
The next effect is the most creative in this collection of free newborn Lightroom presets. It adds sharpness to the child’s photograph by means of minimal color saturation and split toning. Lr Preset Newborn Free #10 "Tonning Warm"
Professional color correction in 1 click. Highly recommended for dark and textured backgrounds. Do you want more Lightroom Presets for Newborns? Check out what we have.